Since the revision to the OSHA regulations regarding Personal Fall Arrest Systems were instituted, an urgent need has been created for satisfactory methods of connecting the PFAS to the suitable anchor, such as a beam. A brief review of the OSHA regulations and ANSI Z359.1 indicated that SUPERCLAMP offers a solution to most of their situations. 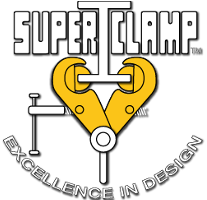 In keeping with the above, please take note that each and every SUPERCLAMP unit is Proof Load Tested at 2:1 and each is fully certified. As an added safety factor, each model has a design factor of 5:1. Please remember that in addition to our authorization and certification of their products for Personnel Use, i.e. PFAS Anchorage Connectors, General Clamp Industries, Inc. maintains complete Product Liability insurance. Also, on special request we can readily paint specific clamps a distinctive color or provide distinctive markings to indicate that they are “For Personnel Use” only. There may be a nominal charge for this service. Proof Load Tested at 13,400 lbs. Heavier duty USC or S series clamps may be used based on beam flange or restricted side loading as detailed here. A Product of General Clamp Industries, Inc.